Try these 1-bowl, 10-minute snack bites made with all of my favorite ingredients! 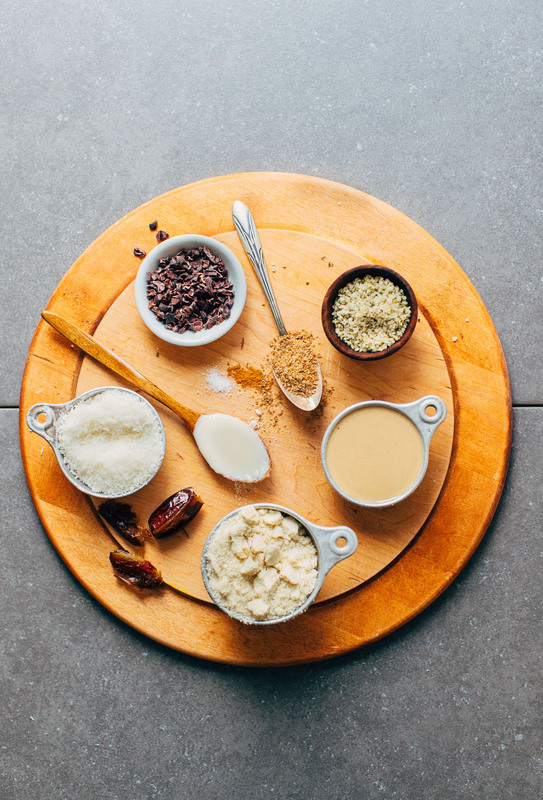 Think tahini, coconut butter, cacao nibs, almonds, and dates. Serious yum. Let’s do this! The dense, little snack bites are inspired by Lee from America’s Coconut Fat Balls, which I tried recently and really enjoyed. 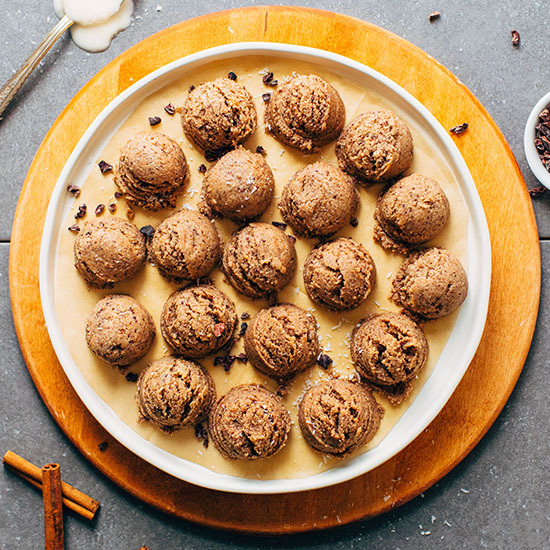 I have since been modifying the recipe and came up with an inspired version of my own, which incorporates almond flour for firmer texture, tahini for nuttiness, and protein powder for a bit more staying power. 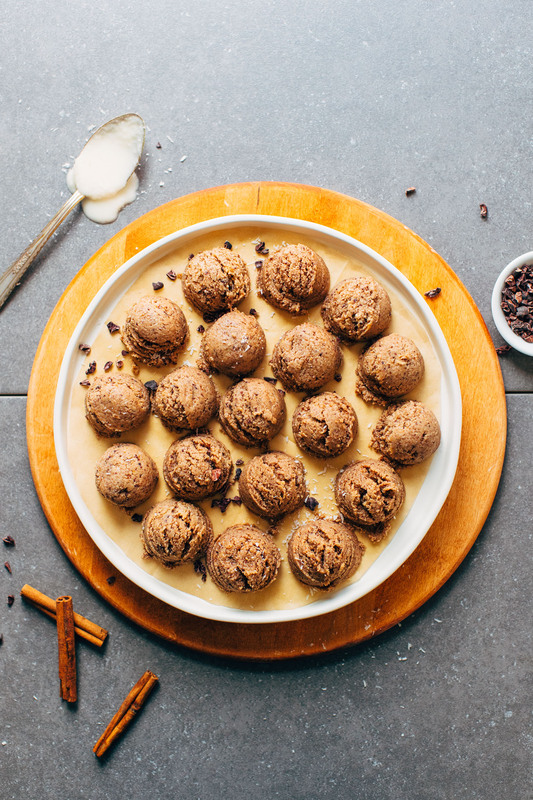 The result is amazing – the perfect snack or healthier dessert I’ve been craving recently. Mmm, just look at all that nutritious goodness happening in 1 bowl! Once blended into a thick nutter-butter-like “dough,” it’s time for scooping! These bites form easily into rounds and are fairly forgiving to work with. No need to roll into balls, just make loose cookie/bite shapes and you’re good to go. Then just a quick chill in the fridge or freezer and it’s snack time! These would make the perfect snack or healthier dessert when you’re looking for something refined-sugar-free. Enjoy in the afternoon with some Golden Milk or a Matcha Latte or in the evening with a Turmeric Tonic. 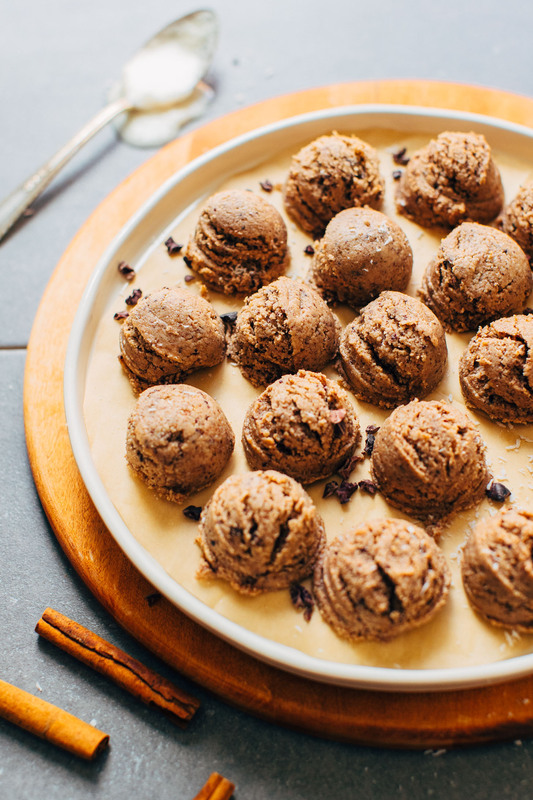 For more healthier desserts, check out my 5-Ingredient Vegan Gluten-Free Cookies, Chocolate Tahini Bombs, and Vegan White Chocolate Truffles! *Recipe updated 6/5/18 for improved texture after some readers commented the bites were too dry or wet. 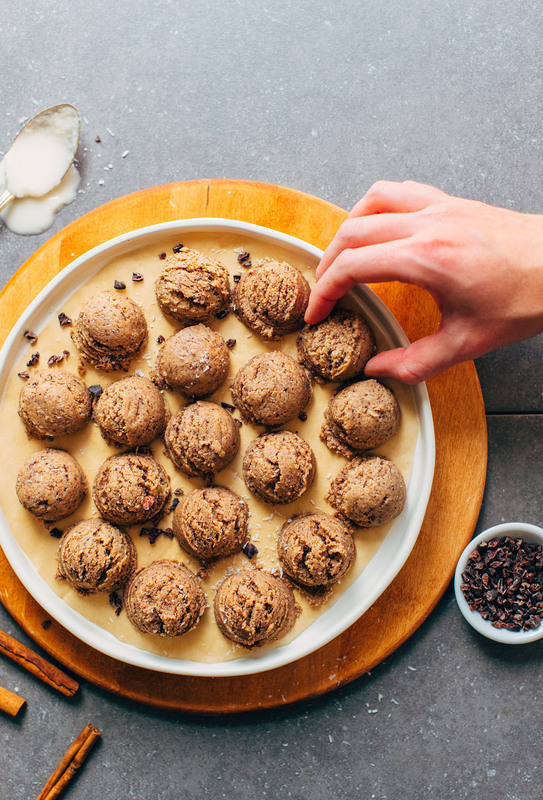 Delicious, 9-ingredient snack bites with coconut, tahini, cacao, and plenty of satisfying add-ins! High in healthy fats and protein! To a food processor, add all ingredients and blend until a thick paste/ball forms (see photo) ~3-5 minutes. Scrape down sides as needed. If mixture is too thick, add more melted coconut butter or tahini (or nut butter). If mixture is too thin, add more almond flour or shredded coconut and pulse. It should be thick and scoopable. Scoop out 2-Tbsp amounts (I like this cookie scoop) and arrange on a parchment-lined baking sheet. As the recipe is written, you should have about 20 bites. *See my full vegan vanilla protein powder review here. I actually used Tropeaka Lean Vanilla Protein Powder here. 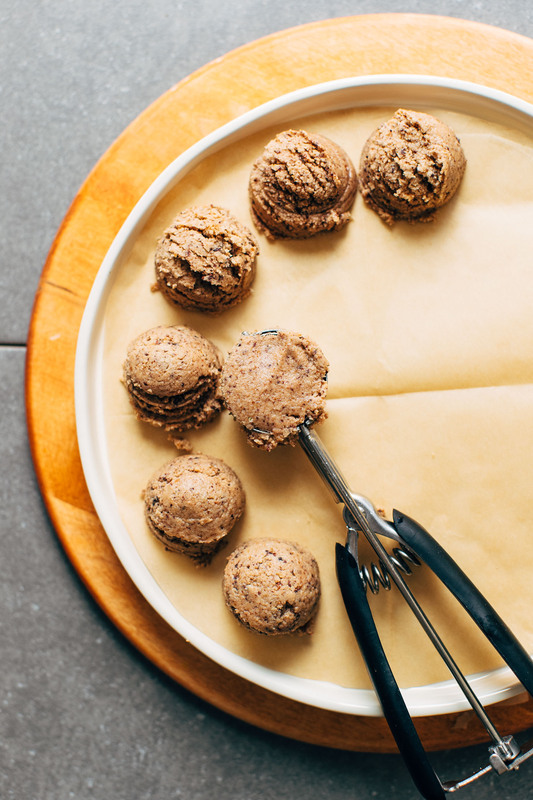 *Tahini that is more dense and scoopable may yield drier bites. You're looking for tahini (or nut butter) that is smooth and creamy. If your tahini is too dry or thick, I recommend substituting another nut butter (such as peanut or almond) that is fresh, smooth and creamy in consistency for best results. *For best results, make sure your coconut butter is melted and scoopable, rather than hardened and difficult to scoop. Otherwise it will have a hard time blending and the bites will likely turn out too dry. *These bites aren't overly sweet, so if you're looking for a sweeter snack bites, add more dates (up to 6-8 as original recipe is written). *Nutrition is a rough estimate calculated with protein powder and lesser amount of dates. *Recipe adapted from the lovely Lee From America. What substitutes would you recommend to try in order to make these a little lower in calories or saturated fats? Hi Nydia, we aren’t sure how they would turn out, but you could try swapping some of the coconut butter or tahini for more dates. They will turn out more sweet and sticky. Hope that helps! These are amazing! Not too sweet anf just perfect combination of tahini, coconut and cocoa nibs. I didnt have coconut butter on hand (and no time to make it 😂) so I subbed for melted cocoa butter. The dough seemed a bit too dry (but I suppose it also depends on the thickness of tahini), so I added a tiny splash of almond milk. We have eaten some and some are saved as desert for the weekdays afternoons – I am already looking forward to that! So if by chance anyone is like me and trying desperately to avoid sugar (dieting, y’know), I thought it would be worth it to report that this recipe is possible to enjoy without the binding/sweetening properties of dates! I used dried coconut, almond flour, flax meal, cacao powder, cinnamon, hemp seeds, vegan protein powder (from Arbonne, chocolate flavor), and almond butter, which replaced both the tahini and coconut butter (1/3 cup and 4 tablespoons total). The only sweetness came from the sweetener already in the protein powder, which is definitely subtle, but in my opinion still enjoyable. Having read through most of these comments, I wanted to be careful not to over-process my dough, while still making sure it was sticky enough to hold together. After processing all my ingredients, I found the mixture was still quite dry, so I added maybe a couple tablespoons of water and processed again. My result was definitely more crumbly than Dana’s dough from the video, but still held it’s shape nicely when packed together with my hands. I formed these into little balls and froze them until firm. They’re actually quite moist and dense even without the help of the dates! I’m pleased with the outcome. I’d like to experiment more with processing time and flavors and see if I can’t get them a little closer to the original recipe. Anyway, if you’re avoiding the concentrated fructose of dried fruits, this should give you an option! I made these today; they are good! I added dates and a little date syrup because my mix ended up being a little on the dry side. The tahini is subtle which I like cause I’m generally not a huge fan but it’s delicious in these! Thanks for the recipe! Do you think that these delicious looking treats be dehydrated using the same recipe? Not sure, and haven’t tried it! If you do, report back on how it goes! What purpose does the flax serve? Can it be subbed? Thank you! Hi! It’s a great source of fibre, but you could probably leave it out! Made this last night – mine came out on a drier side, probably due to both tahini, coconut butter and dates being dry. It still tastes good, very similar to tahini halva, which i love! I formed the mass into small squares instead of balls – it’s easier to handle with the drier texture. Goes so well with matcha latte! Natalia, UPDATE! I figured out what the issue might be if your balls were dry. 1) Your coconut butter needs to be runny and pourable, not hard and chunky. So start there by heating your coconut butter until pourable. 2) Your tahini should ideally be smooth and creamy, as opposed to dry and chunky (which some store bought brands can be). So, if your tahini is on the drier side, try substituting a smooth and creamy nut butter, such as peanut or cashew! The recipe has been updated to reflect these changes. Thanks for your feedback and helping me improve this recipe! Hi! So I tried making this with coconut flour instead of shredded coconut, and cocoa powder instead of cacao nibs…I now regret this because my bites came out rather sandy and dry! I was wondering if you know any inventive recipes I can transform them into? This was completely my fault for experimenting! I just updated the recipe, but I’d definitely say coconut flour was where you went wrong. It’s super absorbent! Hi! What food processor do you use? This doesn’t look like tre one your advertise at the shop. Hi Irena! It is the same one, It’s just placed on a board! No. The blade noted it belongs to Cuisinart dlc-10 but on the shop is a different less powerful model. The only thing dlc 10 has few different variations so I’d be very appreciative to know which one Dana uses. The one in the shop has bad reviews for making but crusts and etc. would u please answer? This has been my first minimalist baker fail – the mix was super dry, I had to keep adding more moist dates, tahini coconut butter which still didn’t help, eventually I had to add some liquid (almond milk – but that just started to make the mixture fun up. I was able to roll it into balls and the flavor was still ok, but it tasted better when it was dry, but it was way to dry to roll…..I wish that I read the other comments on here saying the same thing first. My tahini was a runny one as well and I still had to add a ridiculous amount more of all the other wet ingredients. I am wondering if maybe this recipe has a mistake in it somewhere in the dry ingredients?? Melissa, UPDATE! I figured out what the issue might be if your balls were dry. 1) Your coconut butter needs to be runny and pourable, not hard and chunky. So start there by heating your coconut butter until pourable. 2) Your tahini should ideally be smooth and creamy, as opposed to dry and chunky (which some store bought brands can be). So, if your tahini is on the drier side, try substituting a smooth and creamy nut butter, such as peanut or cashew! Can I substitute the coconutbutter for cacaobutter or another kind of butter? Hi Leila! You could try subbing nut butter for coconut butter! Thanks for sharing! Coconut butter can be finicky. My best advice is to start with desiccated coconut and use a quality food processor! Glad the bites still worked out. xo! I never usually mix tahini in with sweet goods, but I have yet to be disappointed with a Minimalist Baker recipe, so I gave it a try. This was no exception. They almost remind of eating a spoonful of peanut butter, minus the sticking to the roof of your mouth, but also with a slight tahini flavour. Just amazing. I forced my boyfriend to try them – someone who dislikes hummus and tahini in general – and he agreed that they were great. His brother concurred. Thank you! These are really delicious. I made them exactly as written except using coconut oil, as I didn’t have coconut butter. I would have made some, but the mixture looked so dry, I thought my softer coconut oil would be fine.. I added a tiny bit of maple syrup to moisture it and add a little sweetness. Thanks so much, Dana. I am going to give some to a friend who really needs some energy and care. I will bring the rest into teachers I work with who always need energy. The jury is out for me on this recipe. I was so looking forward to them and I ultimately just ended up being underwhelmed. I think I was expecting more sweetness or the tahini was too earthy – not sure. None the less, I’ve realized they taste different (and better!) at room temperature. I think next time I’ll use PB. Also, if anyone has trouble with them being too dry, I added almond milk (was out of tahini) and they turned out fine texture/shape-wise! Thanks for sharing, Hanah! These definitely aren’t meant to be super sweet. They’re more of a coconut-tahini flavor. Add dates or maple syrup to sweeten! Love all these ingredients and I can’t wait to taste them. Questions: Could you substitute coconut oil for coconut butter to ease up on one step? I tried this in my little Cuisinart chopper/grinder, but it didn’t mix well, so I had to move it into the Vitamix and it smoothed everything instantly. Hi Vicki! We haven’t tried it, so we can’t say for sure but it should work! Let us know how it turns out! They were a bit too runny and I felt they may have too much oil and fat content in them that way, so I discarded my strange masterpiece. I want to try them again, because the combination of coconut and cacao is an unbeatable combination. I loved milk chocolate Haystacks when I was young and when I used to eat that way. Now, that I’m vegan, I still love a delicious and healthy sweet treat. So, I’ll keep looking for one of your recipes that has this combination. Vicki, UPDATE. 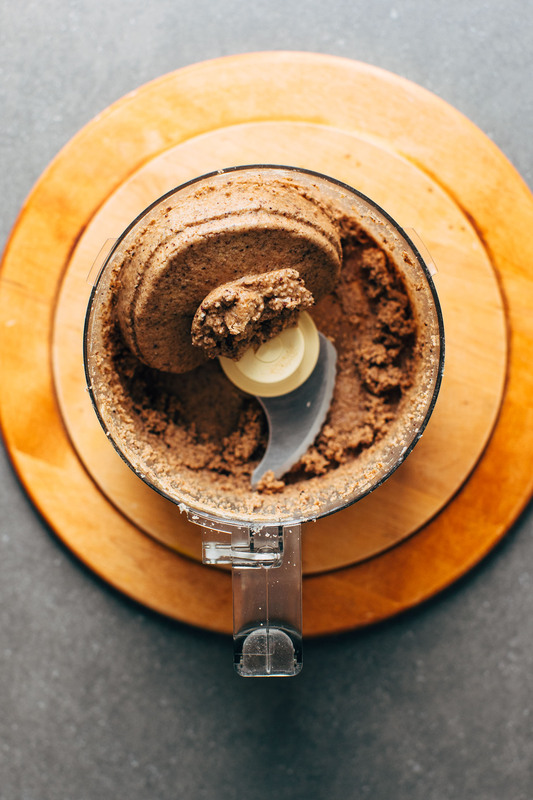 If your batter was too wet I am assuming they were either over-blended into more of a nut butter consistency (try blending for 2-3 minutes instead of 5), or the dry ingredients just needed to be increased. I updated the recipe to reflect adding less coconut butter and tahini. After retesting, by the end of my blending I did need to add 1/4 cup each more coconut flakes and almond flour, which I stirred in with a spoon as opposed to blending. (Over-blending is the enemy here, so stick with pulses and stirring toward the end). Hopefully that helps! Ha! Thanks for sharing, Megan! So kind. I have all the ingredients in the food processor and although it tastes amazing it still looks like very runny nut butter. I’ve added A LOT of extra almond flour and coconut and it’s not thickening up. HELP! Hmm, sounds like perhaps your wet ingredients overtook the dry and you just need to add more dry ingredients until they thicken up. Don’t be shy with the almond flour + coconut! My proportions worked out well for me, but depending on equipment and brands you used, the amounts may vary. T, UPDATE. If your batter was too wet I am assuming they were either over-blended into more of a nut butter consistency (try blending for 2-3 minutes instead of 5), or the dry ingredients just needed to be increased. I updated the recipe to reflect adding less coconut butter and tahini. After retesting, by the end of my blending I did need to add 1/4 cup each more coconut flakes and almond flour, which I stirred in with a spoon as opposed to blending. (Over-blending is the enemy here, so stick with pulses and stirring toward the end). Hopefully that helps! These are great, my husband loves them, he’s not a big sweet tooth, so they are perfect for him. I didn’t have cacao nibs, so I subbed a teaspoon of cocoa powder, perfect! I used my Vitamix, just combined all the ingredients in a bowl first and then added to the blender, worked just fine for me. Would these hold up well at room temp? I am thinking of making them for an upcoming hiking trip. They benefit initially from a freeze. But do hold up at room temp. They might get a little soft, but should hold their shape. Good luck! Thanks for this recipe idea, I look forward to playing with it more in the future. As the recipe is now, it didn’t work for me. As a big fan of ‘Lee from America’ fat balls I was stoked to try this recipe because it doesn’t use coconut oil. But these were just way too dry. My advice to others trying this out is to slowly add the coconut and almond meal after blending the other ingredients. It was way too dry to just adjust a little more tahini and coconut butter. Thanks for sharing your feedback. 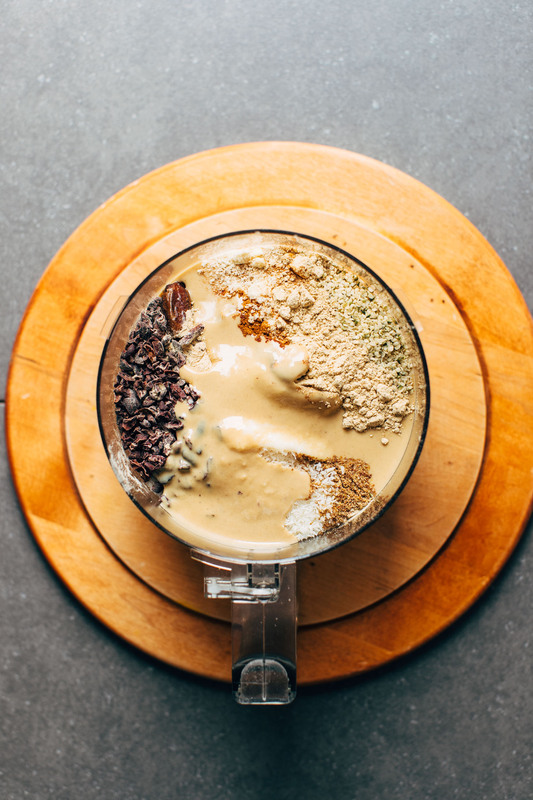 Of course, the end result texture / moisture will depend on the brands of ingredients you use, such as tahini, which varies greatly from brand to brand. Next time I’d recommend adding the dry ingredients a little at a time OR adding more wet ingredients at the end. It’s ironic, because I had the opposite problem happen–mine came out really wet, like cake batter. I added almost two more cups of almond meal/shredded coconut, and when that didn’t work, I even added some tablespoons of cornstarch to try and thicken it up, but it stayed the same consistency. With that said, it tastes amazing, and I’m going to store it in the fridge, and hopefully it’ll become like the consistency of almond butter. We’ll see! I’m not sure what happened, because I used everything you listed in the recipe. Oh well! I had the same issue! I think it was a combo of a warm kitchen, runny tahini and runny coconut butter for me. I added a lot more almond flour and when that didn’t work I stuck the mixture in the freezer for a few mins and it helped for scooping. They’re really tasty! Mara and Mandy, if your batter was too wet I am assuming they were either over-blended into more of a nut butter consistency, or the dry ingredients just needed to be increased. I updated the recipe to reflect adding less coconut butter and tahini. After retesting, by the end of my blending I did need to add 1/4 cup each more coconut flakes and almond flour, which I stirred in with a spoon as opposed to blending. (Over-blending is the enemy here, so stick with pulses and stirring toward the end). Hopefully that helps! Lindsay, UPDATE! I figured out what the issue might be if your balls were dry. 1) Your coconut butter needs to be runny and pourable, not hard and chunky. So start there by heating your coconut butter until pourable. 2) Your tahini should ideally be smooth and creamy, as opposed to dry and chunky (which some store bought brands can be). So, if your tahini is on the drier side, try substituting a smooth and creamy nut butter, such as peanut or cashew! Just saw this, and let the tummy grumbles begin! I didn’t like tahini at first, but it’s rubbing on me now! Better start finding ways to pair it with chocolate fabulously! Sorry to add another annoying sub question to the list :P but would oat flour be a weird substitution for the almond meal/flour? Thanks! Hmm, not sure! If you try it let me know! Hello! I didn’t have almond flour so I used oat flour and they came out great! I’ve made these with almond flour in the past and noticed no difference. Oh my word, thank you so much for the feedback! I have made many of your recipes and absolutely love them all! All of them have turned out perfectly. Thank you so much for your blog and keep up the beautiful work. Any substitutes for dates? Always want to try your sweets recipes but I can’t eat them, would maple syrup work? Any substitutions for hem seeds? Any swap suggestions for the almond flour? I can’t do many nuts/seeds (walnuts, pumpkin seeds, hemp hearts, seasame, pecans, are okay). I SO want to make these babies! Thank you!! Hi Dana! Any suggestions for how to make these without a food processor? I have a Vitamix but I’m worried the dough may be too thick to blend. Hmm, you could probably just mix everything together in a mixing bowl! Or, you could start in a blender, and then transfer to a mixing bowl when it gets too thick. Good luck! Is there any substitute for coconut butter? Can I use coconut flour instead of almond flour? You could sub nut butter for coconut butter. For the almond flour you can try subbing coconut flour. But I haven’t tried it that way. I’d try adding 1/2 the amount listed as coconut flour can be quite absorbent. Good luck! Serious nut allergies in the family … do you make your own sunflower seed meal? hemp seed meal? thanks! You can easily in a blender, magic bullet, or food processor! Seeds should sub in nicely here. *heart eyes emoji* Thanks! I just bought coconut on a whim yesterday, too! Hah! umm, I just made these with Nutella instead of cocoa butter.. they turned out pretty darn tasty. I didn’t mean to post that comment!!! I meant to say you are my idol!! Love the looks of this recipe I can’t wait to try it! Out of curiosity, is the concept to resemble more of a bliss ball or a frozen dessert? No worries! These are more of a “bliss ball” or a snack ball. Not frozen dessert. Do they have a pronounced tahini taste? I’m not a big tahini fan but don’t want to sub it for peanut or almond butter. Not much! You can also sub it with almond or peanut butter if you prefer. These look absolutely delicious. I can’t wait to try them. What would be a good substitute for the hemp seeds?